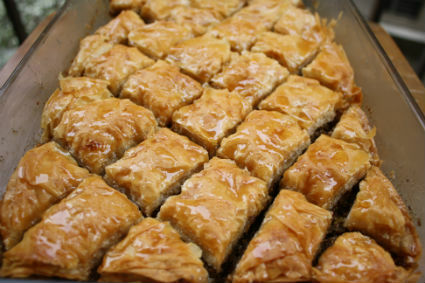 Baklava is one of the favourite dishes of the people of Greece. A tasty and sweet dessert, it has been adapted by many cultures across the world and is one of the top pudding choices in modern cuisine. 1. Preheat the oven to 325 F.
2. Unwrap your pastry sheets – most will measure 12 x 18 inches when they are unwrapped. Use a pair of scissors to cut them in half so they measure 9 x 12 and will fit your baking pan. 3. Brush the pan with some of the melted butter, and place six sheets in the bottom of the pan. Similar to lasagne, but ensure each layer is buttered. 4. Mix a half cup of sugar with the cinnamon and nuts and place half of the mixture on top of the pastry, spreading evenly throughout. 5. Add another six sheets of pastry and continue to butter them, before adding the rest of the nut mixture and the final sheets. 6. Carefully score only the top layer of the pastry before it goes in the oven. Going deeper will not be a disaster but it will certainly affect the quality of your final result. If you are not confident then put your pan in the fridge or freezer first, the hardened pastry will mean it is harder to cut and make errors less likely. 7. Bake for around 45 minutes or till the pastry turns dark golden colour. 8. Meanwhile, mix water and remaining sugar first, before adding the cloves. 9. Cook over high heat for 20 – 25 minutes. 10. As it starts to thicken, remove from the heat and discard the cloves. 11. Stir in the lemon juice and allow to cool slightly. 12. Spoon the syrup onto the Baklava when it is cooked. 13. Store in the fridge once it has cooled sufficiently. 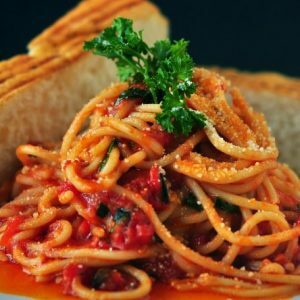 This recipe is contributed by Touristorama. Touristorama helps you plan your vacation and holidays in Greece and the Greek islands. Greece is one of the most beautiful destinations for holidays in Europe. Feel free to comment or share your thoughts on this Baklava Recipe from Awesome Cuisine.